Frozen naturally, to be enjoyed the day you please, promising perfect freshness as though it were caught only moments before your meal. 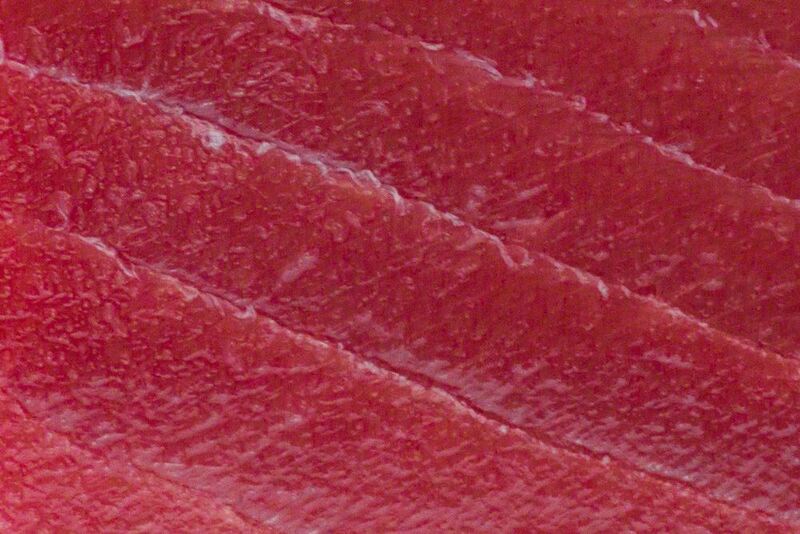 Special freezing technique preserves our Yellowfin tuna as fresh as the day it was fished from the ocean. 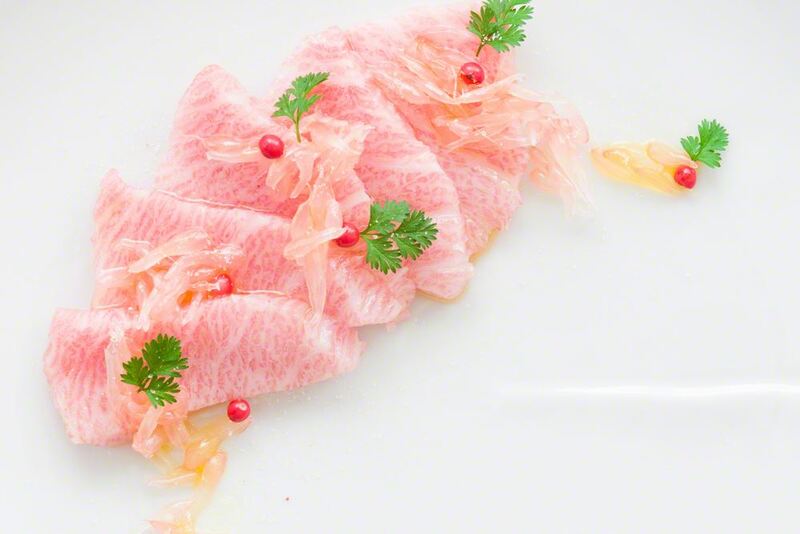 In fact, because of our natural preservation technique, many connoisseurs consider the taste and texture of our SuperFrozen fish to be not only equal, but superior, to that of fish that has never been naturally SuperFrozen. Our quality is always Grade #1. No gases or unnatural techniques are used in our freezing process. And thawing only requires that you run cool water over the package. All our tuna are farmed, including yellowfin tuna. Is the fish caught in sustainable way?? The Superfrozen O2 Tuna is certified sustainable and dolphin-safe. Fresh Yellowfin orders are inititially put into system as preorder. Each morning, fresh yellowfin loin is selected for the orders. Once the loin is graded and quality assured, the delivery date is set. SuperFrozen O2 tuna is already cut and packed with oxygen within the bag. Is SuperFrozen O2 tuna different from CO2 injected tuna? Due to the fact that most standard freezing methods can’t prevent oxidation and are unable to sufficiently starve off decay, tuna processors infuse their tuna with carbon monoxide or smoke to restore the rich redness of fresh tuna. These chemicals leave behind unappetizing traces of carbon dioxide and methane. However, Super freezing is an all-natural process that begins the moment the fish is caught, therefore providing unparalleled freshness without any additives. 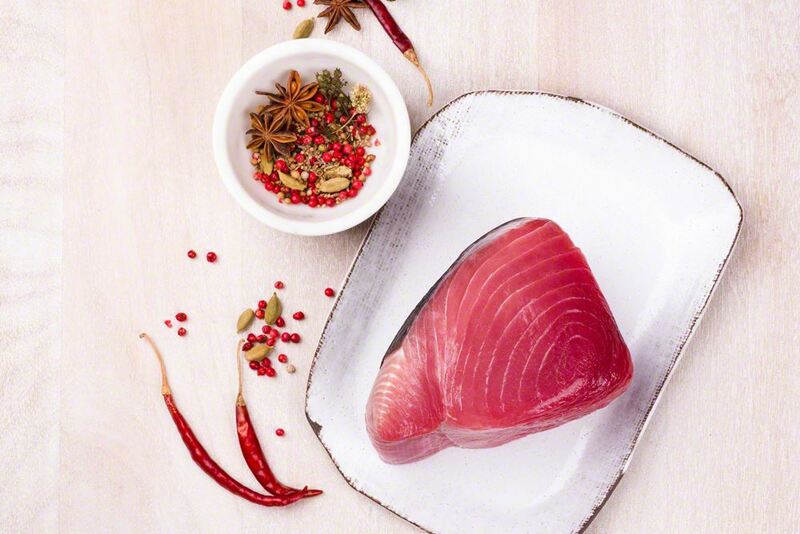 Fresh Yellowfin is sliced to size, and sealed in the only FDA approved air permeable bag for fresh fish. SuperFrozen Bluefin loin are cut to size, vacuum packed. 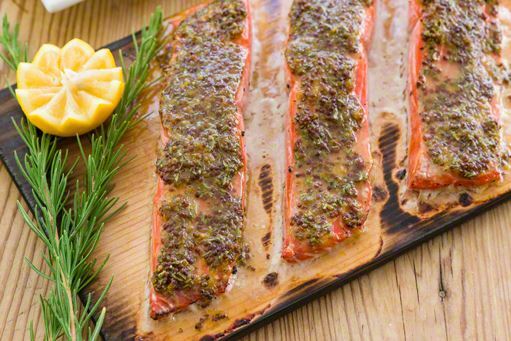 We ship in customized insulation material with gelpack for fresh and a 3 lb-5lb block of dry ice in each delivery of frozen product depending on the weight of the fish. Is it one large piece or small pieces? 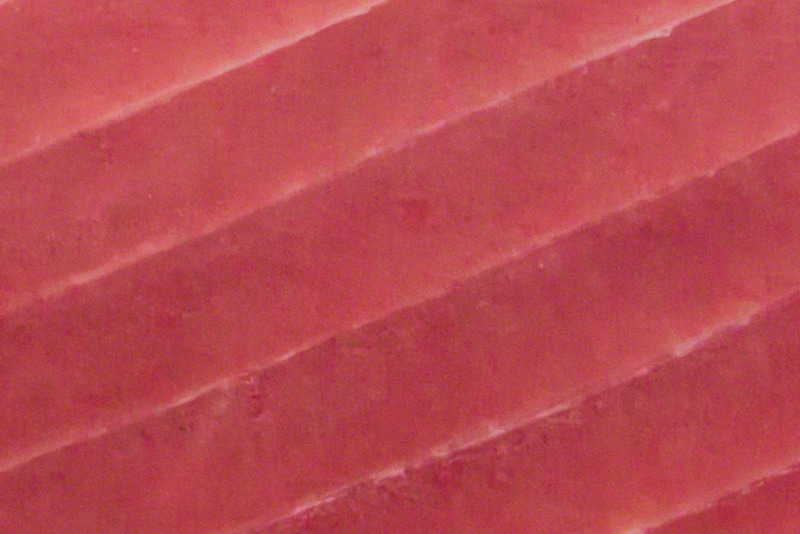 Superfrozen O2 Yellowfin Tuna is cut to size and prepackaged in sealed bag. 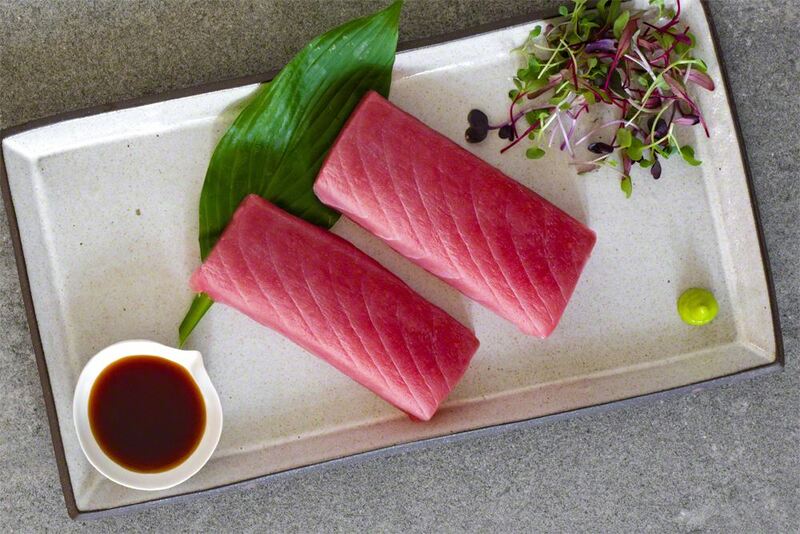 Fresh Yellowfin is sliced in an increments of 1lb. If you would like your tuna order to be 1 large piece, please indicate it at the checkout page in the instruction area. 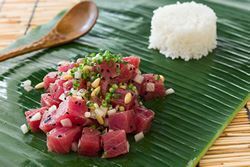 To marinate the tuna, add 2 tablespoons of soy sauce, the sugar, and 1 teaspoon of sesame oil to a sealable bag and agitate to dissolve the sugar. Add the tuna and press out as much air as you can before sealing the bag. Let this marinate in the refrigerator for at least 12 hours, or up to 24 hours. Peel and segment the mandarin oranges and then peel the membranes off each segment. This can be made easier by using kitchen shears to cut the top of the wedge off, allowing you to peel both sides of the segment at the same time. Use a mandoline set to a thickness of 1/8-inch and slice from a cross section of the cabbage. You'll want to leave the core in while you're slicing to make it easier, but be sure to use a knife to cut off the core after you're done slicing. Soak the cabbage and cilantro leaves in cold water to crisp. Prepare a paper towel lined rack. Add 1/2-inch of vegetable oil to a heavy bottomed pot and heat to 360 degrees F. Fry the ribbons of spring roll wrapper turning occasionally to ensure even browning. Transfer the browned spring roll ribbons to the paper towel lined rack to drain. To make the dressing, add 1 tablespoon of soy sauce, the rice vinegar, 1 teaspoon of sesame oil and the salt to a small bowl. Grate the ginger and pass it through a tea strainer into the dressing, pressing on the solids to extract as much juice as possible (you should be able to get about 1 1/2 teaspoons of juice). Discard the solids. Whisk the dressing together, adding white pepper to taste. 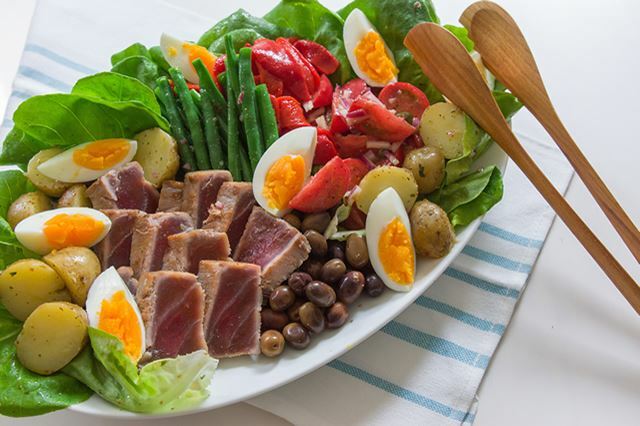 Remove the tuna from the marinade and slice into 1/2-inch cubes. Add the sesame seeds to a small tray and roll the cubes of tuna around in the sesame to coat evenly. When you are ready to assemble the salad, drain the cabbage and spin in a salad spinner to dry. Add the cabbage, cilantro and chopped scallions to a bowl and toss with the dressing to taste. To plate, lay a piece of Bibb lettuce at the bottom of each plate and then divide the dressed cabbage between the plates. 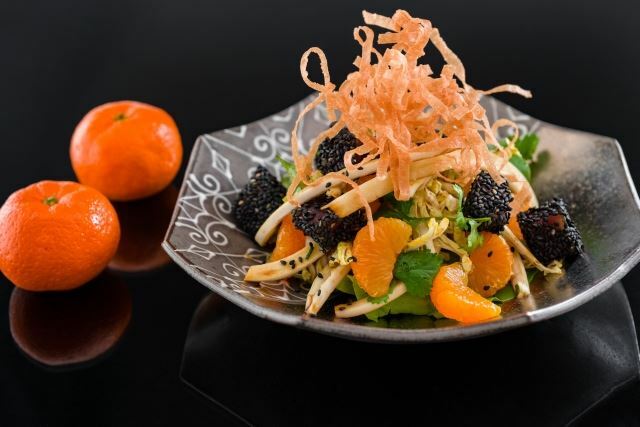 Top with the black sesame encrusted tuna and the mandarins. Finish with a nest of fried spring roll ribbons.